I’m not sure why cinnamon red hots (also known as cinnamon imperials) are so quintessentially “Valentine’s Day.” I guess because they’re bright red. And hot. And candy. Okay, maybe I know exactly why cinnamon red hots are a Valentine’s Day thing. Never mind. 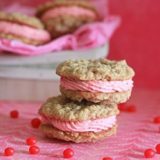 Anyway, I bought into it and decided that I needed to combine oatmeal cookies with red hots for Valentine’s Day this year. It had to happen. First, I baked red hots right into some oatmeal cookies chocolate chip style. Cute and quite delicious, sure, but “dental hazard” was an understatement. I do not recommend it. So the wheels started turning again, eventually stopping at oatmeal sandwich cookies. Ever since I saw these, quite possibly the most adorable sandwich cookies ever, I guess I’ve had oatmeal sandwich cookies on the brain. So the next logical oatmeal-and-red-hots experiment was, well, a no-brainer. Cue cinnamon red hot buttercream. The better to stuff you with, my dear sweet oatmeal cookies. 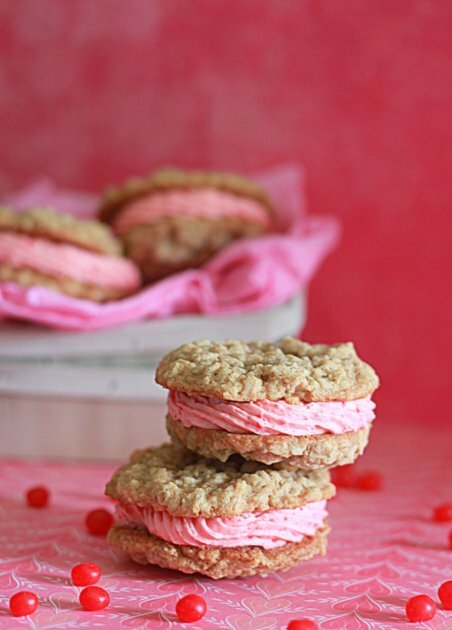 Oh, and to prove my Valentine’s Day love for you, the oatmeal cookies contain whole-wheat flour, which totally cancels out the buttercream. 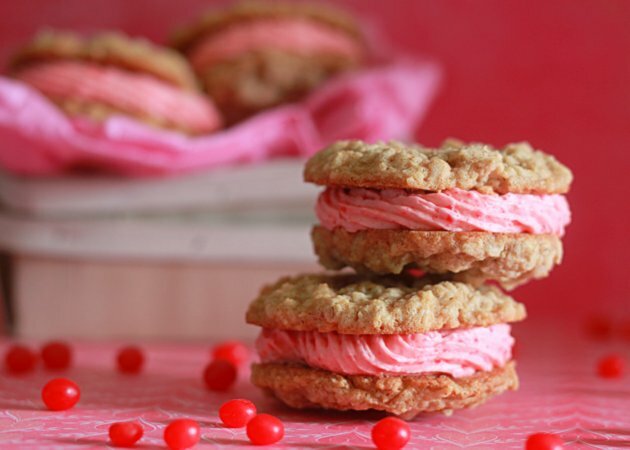 Soft oatmeal cookies sandwich a perfect plop of spicy-cinnamony red hot buttercream frosting. Just right for Valentine's Day. In the large bowl of a stand mixer affixed with the paddle attachment or in a large bowl using a hand mixer, beat the butter, granulated sugar, and brown sugar until fluffy, about two to three minutes. Place a sifter over the bowl and sift in the flour, baking soda, salt, and cinnamon. Add the oats. Mix just until blended. Place rounded tablespoonfuls of dough onto a nonstick, ungreased cookie sheet (or line the cookie sheet with a silpat). Bake for about 8 minutes, until the cookies are set and the edges begin to brown. Remove from oven and let cool on the cookie sheet for about five minutes, then transfer to a wire rack to cool completely. In a very small saucepan, add 1/4 cup cinnamon red hot candies and 1/4 cup water. Stir frequently over low heat until candies are dissolved, about 10 minutes, and remove from heat. Cool to room temperature. Using a food processor, crush the remaining 1/4 cup cinnamon red hot candies until pulverized. Set aside. In a stand mixer affixed with the paddle attachment, beat the butter at medium speed until pale and fluffy, about one minute. Reduce the mixer speed to low and slowly add the powdered sugar 1/2 cup at a time until each addition is well-incorporated. Increase speed to medium and beat for about a minute, scraping down the sides if necessary, until light and fluffy. Reduce the heat to low and slowly drizzle in the cinnamon red hot syrup. Add the pulverized candies and the pinch of salt and mix, scraping down the sides of the bowl as needed, until well-combined. Note: I like to use a pastry bag or a Ziploc bag with a frosting tip to make quick work of filling sandwich cookies, but you can use a knife, too. Turn half of the cookies upside down and add about 2 - 3 tablespoons of frosting to each upside-down cookie by simply squeezing a generous circle of icing from your pastry bag or Ziploc bag, or spread with a knife. Top with the second cookie. Cookies will keep in an airtight container at room temperature for 2 - 3 days.